The National Film Board of Canada is a unique cultural set in the world. It was established on May 2, 1939 by John Grierson, who was a documentary film maker and worked with Eisenstein’s Battleship for American release, and also Robert Flaherty who’s Nanook of the North he had seen several years earlier in Scotland. These two great directors represented opposite poles in their respective approaches to filmmaking. As the Dutch filmmaker Joris Ivens recalled, Grierson would quote the Bible to a Communist and Lenin to a Catholic (Evans, 1991). Morris (1987) in Re-thinking Grierson explained: It is generally well-known that Grierson came from a Calvinist background. In particular, his family had been members of the very rigid sect known as the “Wee Frees”. Calvinist attitudes involve a rigorous sense of discipline and obligation and a sense of duty to the community combined almost paradoxically with a rebellion against establishment orthodoxy. Calvinism was bitterly opposed to international capitalism, to banking and international finance yet, at the same time, saw wealth as a sign of the grace of God and, conversely, that poverty was deserved. Grierson himself was a lay preacher during his university years. His dream was to make the National Film Board the eyes of Canada and to ensure that it would, through a national use of cinema, see Canada and see it whole: its people and its purpose. Nelson (1988, p. 14) in “the colonized eye” hints to Grierson’s documentary movement and says “what Eisenstein, Pudovkin, and others had done for Bolshevik Revolution, what Goebbels would attempt to do for Hitler’s National Socialism, Grierson tried to accomplish for multinational capitalism”. “We have our moods of resolution and also our moods of relaxation. The movies until now have concentrated on the moods of relaxation. We have made a big business out of our moods of relaxation; we have not concentrated nearly so much on our moods of resolution. Yet, on the face of it, it is in our moods of resolution that we may be expected to build the future. Theses moods are worth organizing, just as deliberately as the movies, the newspapers and the show business generally, have been organizing our moods of relaxation” (Nelson, 1988, p. 81). Joyce Nelson also refers to similarity of Greirson view to that of Joseph Goebbels: “Entertainment can occasionally have the purpose of supporting a nation in its struggle for existence, providing it with edification, diversion and relaxation needed to see it through the drama of everyday life. But, that is only its incidental purpose. By which I mean that today film has to serve a political function. It is a means of educating the people” (Nelson, 1988, p. 80). This article will examine the NFB logo as propaganda. It will address how it came up to be such an omnipresent symbol, not only inside Canada, but also for popular culture in general. The symbol will be used to explain propaganda through other example which attempt to force people to behave in a special way. In 1965 the idea to create a logo for NFB was mooted. It was not until early 1967 that board decided to hire two graphic designers to come up with appropriate symbol. The primary attempt proved unsatisfactory. After an internal competition within the NFB, George s Beaupre’s “Man seeing” was the winner of the competition (Evans, 1991). Let us break down the logo and its particular meaning. By design, Georges Beaupre attempted to create a symmetrical design which consists of three distinct elements: a man, an eye, and a globe. The man “Man seeing” symbolizes the mankind, who embraces the world and creates a candid eye through which the world can be seen. The symmetrical design, in my opinion, points out to order and a form of balance or justice. Furthermore, there are no letters involved in this design, which refers to importance of visual communication rather than verbal ones. The world substitutes the head which also refers to unity of mankind and simultaneously represents the eye which, in my opinion, projects the National Film Board of Canada – a visionary man or John Grierson. The whole logo also visualizes an Eskimos or a native of Canada covered in color green which can be referred to nature or life as well. The logo “Man seeing” represents mankind, which goes beyond the national territories. Re-examining the history of cultural policy in postwar Canada shows us that Canada has always explored the connection between nationalism and internationalism. This stems back to the Cold war period (1946-1989). The polarization of the world and political configuration of the postwar created a ground for countries such as Canada to shape public opinion beyond its border. As Druick (2006) explains in her article, the crises of postwar – return from economic depression, and a reconfigured world order – were symbolized, in the formation of United Nations in 1945. Between 1945 and 1950, UNESCO – the UN‘s faction to encouraging peace through education and cultural exchange – whose claim to fame was to provide a basis for international diplomacy and dialogue, created a ground for liberal internationalism against fascism and communism. This ideology was absorbed and crystallized by the Massy Commission – the Royal Commission on National Development in the Arts, Letters and Science – and later helped Canada to legitimize artistic and cultural attempt to establish public funding for the arts. On the other hand, the cultural polarization and foreign mass media had caused Canada to reconsider its national culture and its role in world culture in new ways. That is, participation of Canada in all forms of cultural exchange in accordance with UNESCO as well as bringing the Canadian needs to the attention of UNESCO by way of External Affairs. According to UNESCO discussions of the late 1940s, film was the most important media to educate people and “ the only mass communications medium which effectively crosses frontiers and perhaps the most potent force by which one modern culture influences another” (UNESCO, 1995, p. 3). Since 1939, the National Film Board had been making educational and documentary films in Canada and could not ignore the UNESCO principles. This relationship to UNESCO was so of an important, that John Grierson the founder of NFB went to UNESCO to direct its media division (Druick, 2006). However, United States saw him as a threat to national security and perpetually chagrined his position at UNESCO and eventually he had to leave the UNESCO (Evans, 1984). A report distributed by UNESCO on September 9th 1955 with this title “An enquiry into the use of film as a vehicle for information about other countries and as an instrument of international understanding” (“unesco1955.pdf,” n.d.). It points to the importance of television and film as a weapon for peace and in particular tries to bring people beyond their own frontiers and show them a different way of life and thinking. In this regard, the productions of NFB was not only a domestic project, but was introduced to an international cultural community. Harold D. Lasswell Provides a definition of propaganda that states, “Propaganda is the management of collective attitudes by the manipulation of significant symbols.” The goal of every propagandistic action is to persuade people to change their behavior (Cull, Culbert, & Welch, 2003, p. 319). Henderson (1943) suggests a working definition of propaganda as follows: (1) propaganda is distinct from education, however, the education might itself- at times- be propaganda. (2) Propaganda appeals to feelings and emotions. (3) Propaganda spread falsehood. (4) Propaganda works by suggestions in a systematic way. (5) Propaganda conceals its sources, motions, methods, etc. (6) In terms of methods; propaganda can be differentiated from non-propaganda. In this regard, Lasswell indicates that “the method distinguishes propaganda from the management of men by violence, boycott, bribery, and similar means of social control. Propaganda relies on symbols to attain its ends” (Choukas, 1965, p. 14). Propaganda, also results from the fact that we are free, to some extent at least to make up our minds – to take it or leave it. So, propaganda is a method of persuasion. The victim is led to believe that the conclusion, the attitude, or the act that he adopts is really his own free choices. For example, the Massey commissioner and founder of NFB, John Grierson, repeatedly emphasized that “film propaganda was legitimate weapon of the state – a weapon to forge a national consciousness and collective will” (Pronay & Spring, 1982, p. 1). Barnouw (1993) identifies three major paths in developing documentary films. The first path refers to Robert Flaherty’s Nanook of the North. In this documentary Flaherty takes the audiences to the world of exotics and shows us the hardships of other remote cultures. The next path shows us the development of specific genre of documentary film that explores the lyrical dimension, and finally the potential of documentary film was realized in service of promoting political or social agenda. Evans (1984) explains that documentary dramatizes the fact instead of fiction and tries to render a creative understanding of actual event around us. In documentary film subjects are non-theatrical and they are real. Although documentary film offers information and description about immediate social situation, but audiences prefer to be entertained. In this regard, most government did not seem to be very impressed with that kind of genre. However it was an exception with Canada. As Evans (1984) explains, Canada was one of the first countries to see the practical application of film for specific ends, namely to attract and settle immigrants in vacant North West. In documentary films produced by Canadian Pacific Railway (CPR), Canada was presented to potential homesteaders. In those documentaries, we see the earliest uses of propaganda which suppress information, mainly under order from CPR winter scenes was cut in order to give no credence to widely held British belief that Canada was a land of ice and snow. Canada continued its documentary film productions for wartime propaganda and in late thirties it was happy coincidence that Grierson was exploring the possibilities of transplanting the documentary idea to an international level to place Canada in a world of upheaval. 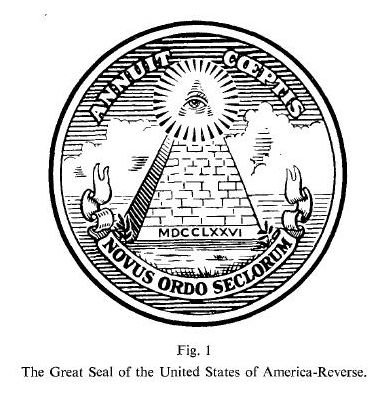 There must be an analogy between the eye in NFB logo and the eye in a triangle that appears on the great seal of the United States. This symbol was called the “eye of providence” by designer of the seal. The origin of the eye might lie in the Greek classics. However, from our perspective in 21 century, it seems obviously the triangle symbolizes the trinity of Christianity. The symbol was also adopted by freemasonry. One other clue refers the origin of triangle to Hebrew word of God which was found inside the triangle. In German literature it appeared as Auge Gottes which says that the eye of God is watching over the city benevolently to protect it (Potts, 1973). The aforementioned literature reveals that National Film Board of Canada pursues a propagandistic ideology. 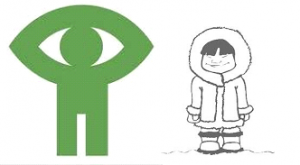 The eyes of Canada which appears in NFB logo simply represent the vision of their founder to persuade people to have a twisted image about Canada. This twisted images – not always negative – as described in propaganda definitions led victims to believe that the conclusion he/ she adopts is really his/ her own free choices. The logo also indicates the NFB mission as divine and has sort of supremacy toward other nations. As former Prime Minister Pierre Trudeau described “living next to the United States is in some ways like sleeping with an elephant. No matter how friendly and even-tempered is the beast one is affected by every twitch and grunt” (Pendakur, 1990, p. 33). Whereas Canada’s ability to compete with relaxation category (Hollywood) which has done so good job was limited, NFB focused on that resolution category and created a plenty of documentary and educational films. These documentaries and educational films to some extent were reflecting the government’s ideology toward reorganized world. That is, a form of government advertising. As Paul Rutherford in his review on “making pictures” indicates, “ the propaganda may take the shape of static-laden reports, press release, press conference, stunts, and hoaxes but, ordinarily, the most visible and most common genre is advertising: government ads, public service announcement, partisan commercials, issue advocacy, charity appeals, corporate-image campaigns, and on and on” (Paul Rutherford & Rutherford, 2001). As a result, NFB propaganda creates pseudo-environments in which people around the world see Canada. Moreover, this pseudo-environment was channeled through UNESCO, an organization that links nations to each others culturally and conjures up the collective minds about Canada. Marinating this image for Canada was/ is very significant. Barnouw, E. (1993). Documentary: a history of the non-fiction film. Oxford University Press, USA. Choukas, M. (1965). Propaganda comes of age. Public Affairs Press. Cull, N. J., Culbert, D. H., & Welch, D. (2003). Propaganda and mass persuasion: a historical encyclopedia, 1500 to the present. ABC-CLIO. Druick, Z. (2006). International cultural relations as a factor in postwar Canadian cultural policy: The relevance of UNESCO for the Massey Commission. Canadian journal of communication, 31(1). “Evans, G. (1984). John Grierson and the National Film Board: the politics of wartime propaganda. University of Toronto Press. Evans, G. (1991). In the national interest: a chronicle of the National Film Board of Canada from 1949 to 1989. University of Toronto Press. Henderson, E. H. (1943). Toward a definition of propaganda. Morris, P. (1987). Re-thinking Grierson: The ideology of John Grierson. Dialogue: Canadian and Quebec Cinema, 3, 21–56. Nelson, J. (1988). The colonized eye: rethinking the Grierson legend. Between the lines Toronto. Pendakur, M. (1990). Canadian dreams and American control: the political economy of the Canadian film industry. Wayne State University Press. Pronay, N., & Spring, D. W. (1982). Propaganda, politics and film, 1918-45. Macmillan.